Welcome to York House Penthouse, our stunning apartment in the charming seaside resort of Llandudno. Enjoy this light & spacious apartment in a recently converted lovely Victorian house, on a quiet residential street in the middle of the conservation area. Every comfort & luxury is catered for, from top quality bathrooms, to stylish furniture & superbly equipped kitchen. This apartment is Adults only. It's a special place to come back to & relax after exploring the delights of this beautiful resort & the nearby stunning coast & countryside. You can even take in the great views of the Great Orme & the Welsh mountains from the lounge. "Simply stunning, simply superb in every detail". "Best apartment we've ever stayed in"! "The overall quality of literally everything in the apartment was fantastic". Llandudno is a year round resort & our apartment reflects this, withfull central heating throughout. We bought this beautiful, newly converted, apartment when we gave up the day jobs. Holidays have always been very important to us and we appreciate the nice things in life. We therefore put a lot of care & into creating a lovely holiday apartment. We want you to have the best possible holiday when you choose to stay at York House Penthouse. We get enormous satisfaction when our guests reward our efforts with wonderful feedback. In our opinion, Llandudno is one of the most beautiful resorts in Wales. Its lovely setting, between two shores & the beautiful Victorian Prom & Pier, make it unique. Trip Advisor have just named Llandudno the Best Seaside Resort in the UK (March 2016) and we totally agree! It is a year round resort. Out of season we enjoy stunning coastal walks, yet can still return to enjoy the great choice of shops, cafes and restaurants in town. In the summer months the beaches & prom are bustling, with a great atmosphere. However, there is always a quiet spot to be found, walking on the Great Orme or the coastal path, or whiling away the time in one of the nearby lovely public gardens. The fast access via the A55 expressway makes it easy to get here, even if it's just for a quick restorative break. It's great being able to park the car & forget about driving when you feel like it. Everything is on hand in the resort. You can even stroll along the Prom to the Venue Cymru, where we've enjoyed some amazing touring productions from the West End. We have lots of information, maps and books on the local area, available in the apartment for your use. Spacious & stylish loft style lounge, with high cathedral ceiling, & mezzanine above. High quality leather sofas, flat screen TV, DVD player, Sky TV with movies & sport. iPod Dock. Dining area with modern glass table & 4 chairs. North Wales is a great golfing area. Maesdu Golf Club & North Wales Golf Club are a short drive from the apartment. Conwy Golf Club & Rhos-on-Sea Golf Club are a few miles further. Stunning apartment, spotless and extremely well appointed. Can’t express how pleased we were to find this lovely little gem. Arranging to stay again. A beautifullly presented, immaculate and comfortable property. We had a very enjoyable 3 nights here. 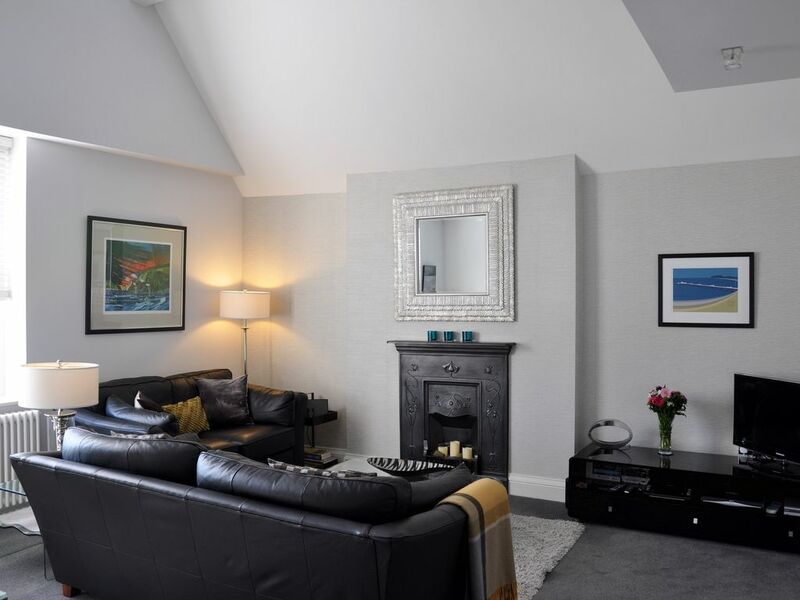 The property is very comfortable, well equipped and peacefully quiet and is a wonderful base for a stay in Llandudno. It is in a pleasant part of town, within easy walking distance of both beaches, the Great Orme and the shops. We had a very relaxing break and will certainly come back to stay here. Many thanks to Kay. My wife and I arrived on sunday afternoon and stayed until Wednesday morning. From the moment we walked into York house we knew we had chosen well,the quality décor,even in the entrance hall is most impressive.On entering the apartment we were both instantly delighted,the quality of the furniture,fitments and every item we came across was of the highest order.Kay and Dave, obviously,have great taste in décor the attention to detail very noticeable ,the apartment is also extensively equipped,we wanted for nothing.We loved our stay and will definitely be returning. Wonderful 4 night New Year break with husband and 2 friends in beautiful 2 bedroom apartment in centre of Llandudno, 10 minute walk to promenade and close to shops, great restaurants and pubs. The apartment is equipped with everything you need for a relaxing break, with luxury fittings and modern decoration. Xmas decorations in apartment and a lovey bottle of fizz from the owners to celebrate the new year. Extensive information provided in apartments re thing to do and where to eat. We visited Carlo’s Italian restaurant, The Cottage Loaf, The Kings Arms and LC bistro , all providing excellent food and service. Loads of things to see and do in Llandudno and short drives to nearby seaside villages. On New Year’s Day we walked to summit of The Great Orme, great views of Llandudno and surrounding areas. We will definitely be recommending Llandudno and the penthouse apartment to our friends and family and we hope to make a return visit in the summer. Thank you for this glowing review! I’m so pleased that you had such a wonderful stay. Our apartment has everything to make it very comfortable for a winter break & Llandudno, as you’ve discovered, is definitely a year round resort. Hope to be able to welcome you back again for a summer break. We had a wonderful four night New Year stay at No 7 York Ave Penthouse Apartment. Decorated and furnished to a very high standard. Fully equipped with everything you need for a relaxing away from home stay. Only a short walking distance from the promenade, shops and great restaurants and pubs. The owners of the property provided us with extensive information about the property and area and gave us contact details if we required any further assistance. A beautiful apartment which we would definately recommend if wanting to visit Llandudno and surrounding area. Carlo’s Italian restaurant, The Cottage Loaf, The Kings Arms and LC stay and dine all excellent places to eat and drink with good varied menus and wonderful service. Thank you so much for this lovley review! We are delighted that you had such a great New Year at York House Penthouse. It’s lovely to know that you enjoyed all the comforts of the apartment. We love the fact that there’s always so much choice of places to eat in Llandudno all year round & it sounds as if you certainly enjoyed a great selection that the resort has on offer! We hope you can return to explore a few more before too long. Thank you for this lovely review! We are so pleased that you enjoyed all the little luxuries that our penthouse apartment has to offer. Hope you can revisit sometime to enjoy them some more! A short stroll to North Shore beach, the promenade & Victorian pier. There are often special events on the prom, eg Classic car rallies, arts events &, of course, the traditional Punch & Judy show! Beautiful, unspoilt West Shore beach is just ten minutes walk away via the lovely Haulfre Gardens or straight down Gloddaeth Avenue. This is where you can pick up the Welsh Coastal Path & is the starting point for a delightful stroll down the Conwy Estuary into the old castle town of Conwy. With great transport links to Llandudno by rail or bus & the apartment being so centrally situated, a car is not essential. Llandudno station is a ten minute walk away. Direct trains run from London to Llandudno Junction Station (4 miles away) in just 2.5 hours. Liverpool or Manchester Airports are approx 70 miles away & easily reached by car via the A55 expressway or by train. Holyhead ferry port is just 43 miles away for ferries to Dublin. The walled Medieval town of Conwy, with its magnificent Castle is only 4 miles away. Snowdonia National Park is a short drive away for magnificent walking & scenery. Easy day trips can be made to the Isle of Anglesey, the old roman City of Chester, or further down the coast to Caernarfon or the beautiful Llyn Peninsular. There is a great range of shops & eateries on the high street, a short stroll away, including a Sainsburys Local, with extensive opening hours. At the end of the high street is the Mostyn Retail Park with Debenhams, Next, and other well known stores. Llandudno Leisure Centre and Ten Pin Bowling is in this part of town too. The oldest pub in town - the Kings Head - is our 'local', a few minutes walk away & the wonderfully restored Llandudno Trams set off up the Great Orme from just outside here. Close by are the Happy Valley Gardens, dry ski slope, toboggan run and entrance to the Great Orme Cable Car. The excellent local theatre, Venue Cymru, is situated on the Prom & regularly attracts high profile performers & quality touring productions. A multi-screen cinema complex can be found at Llandudno Junction (4 miles). The beautiful Bodnant Gardens (National Trust) are a short drive away down the Conwy Valley & close to this is the award winning Welsh Food Centre with shops & restaurants for you to experience local produce. North Wales has 4 mountain ranges, 250 miles of coastline & 5 world heritage sites - you will never be short of things to do in this area!